The New Moon in Aquarius is in conjunction with 52872 Okyrhoe, a centaur planet discovered in 1998. It is named after the daughter of Chiron and Chariklo in Greek mythology. The name means “swift running” or “fast flowing”. Okyrhoe was a nymph and a prophetess, who was changed into a mare by the gods as punishment for revealing their secrets to humankind. Her ability to speak was thus taken. Perhaps slight resemblance with the myth can be sensed in the current challenging situation of the press in the USA, when Trump’s government tries to silence journalists. Mercury has just left the shadow phase after its retrogradation. Mercury rules all types of communication and mental activities. 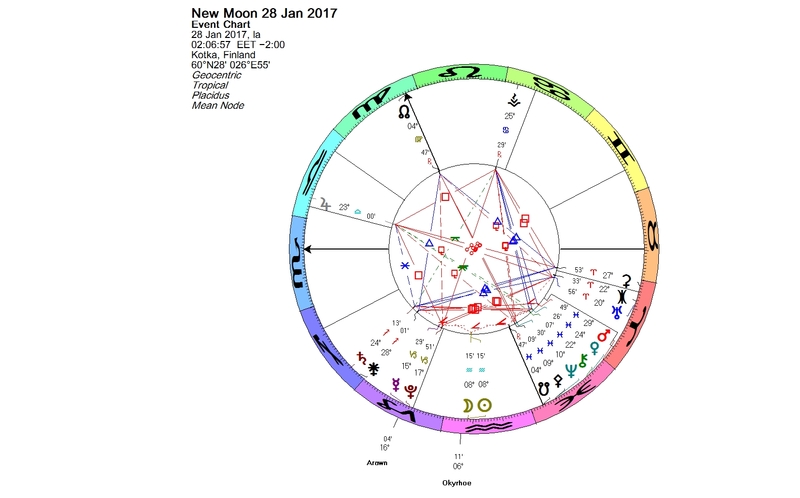 In the New Moon chart it is in Capricorn in conjunction with Pluto and 15810 Arawn. 15810 Arawn is a recently named trans-Neptunian object which was discovered in 1994. According to the naming rules of the International Astronomical Union, all plutinos are given mythological names associated with the underworld. The name Arawn comes from the Welsh mythology. In Welsh mythology, Arawn was the king of the otherworld realm of Annwfn. Arawn and Annwfn appear in the Mabinogion, a collection of 11 medieval Welsh folk tales. Annwfn was like a paradise. It was a world of eternal youth where disease was absent and food was ever-abundant. Research on the astrological meaning for Arawn has begun. In the meanwhile I can offer two examples of singer-songwriters who heavily draw on the Celtic tradition. Van Morrison (born August 31, 1945), who even has written a song called “Tir Na Nog”, has his Sun in close conjunction with Arawn. Tir Na Nog is the Otherworld in Irish mythology. It is a heavenly place, just like Annwfn. The Sun represents the main expression of the individual. Astrologer Bernadette Brady has written, that “it reveals the myth or story that the individual follows through life.” The conjunction is an aspect which combines the energies of the two planets in question. A Canadian musician Loreena McKennitt (born Feb. 17, 1957) performs Celtic music. Her Jupiter is in conjunction with Arawn. Jupiter emphasizes and strengthens everything it touches. In mythology, both Mercury and Arawn were psychopomps. They were able to travel between the worlds. The psychopomp is a guide who escorts newly deceased souls from Earth to the afterlife. In Jungian psychology, the psychopomp is a mediator between the unconscious and conscious realms. Pay attention to your present dreams, as they may reveal something important to you. The Full Moon is always an opposition of the Sun and the Moon. 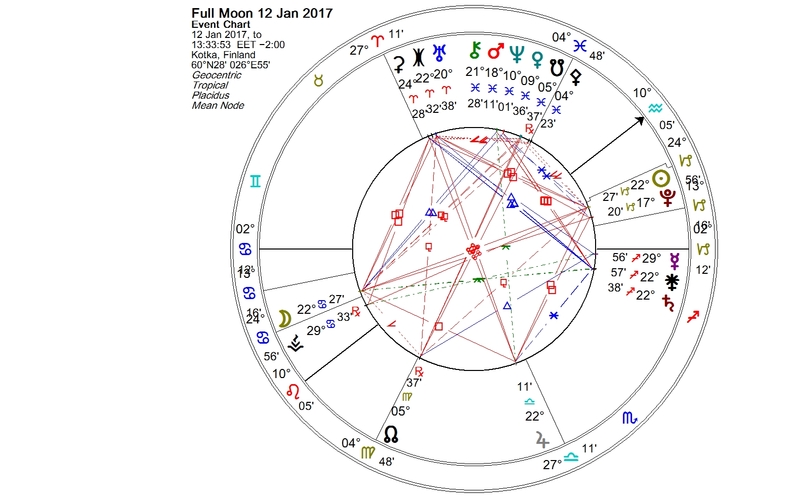 Today the Sun-Moon opposition on the Cancer-Capricorn axis was crossing another opposition, which was formed by Jupiter in Libra and Uranus-Eris conjunction in Aries. The square pattern, which was thus formed, is called a grand cross. A grand cross has sometimes been called the “make-or-break pattern”. The interpretation of a grand cross depends on the quality of the signs in question, and also on the planets involved. A good amount of pressure can be felt, but since today’s cross was in the cardinal signs, and the Sun and the Moon — the givers of life – were participating, the meaning of this Full Moon is manifesting more on the making. The luminaries are rapidly moving planets, so this grand cross is soon unraveling. If the participants were slow-moving outer planets, there would be more dramatic feeling present. Uranus and Eris are forming a conjunction in 2016 and 2017. The previous time that they were in a conjunction with each other, was in 1927 and 1928. In mythology Eris was the rejected Greek goddess of strife and discord. Themes of exclusion and alienation can also be associated with the astrological Eris. Also in the following example a gut feeling of being excluded can be sensed. Bossa nova is a music genre which came popular in the 1950s and 1960s. Bossa nova means literally “new trend”. In 1964 one of the best-selling jazz albums of all time, Getz/Gilberto, was released. Brazilian guitarist João Gilberto’s then wife, Astrud Gilberto sang a track called ”The Girl from Ipanema” on the album, which made her an international star. American saxophonist Stan Getz (born Feb. 2, 1927) and the composer of the song, Antônio Carlos Jobim (born Jan. 25, 1927), are both having the Uranus/Eris conjunction in their charts, Eris at the Aries Point. Unfortunately the clock times are unknown, but there was a New Moon in Aquarius (the sign ruled by Uranus) on the same day when Stan Getz was born. Also Antonio Carlos Jobim’s Sun is in Aquarius. Astrud Gilberto (born March 29, 1940) has a Sun-Eris conjunction in Aries. Her Jupiter is also in the same sign. You are currently browsing the Lunations by Kirsti Melto weblog archives for January, 2017.